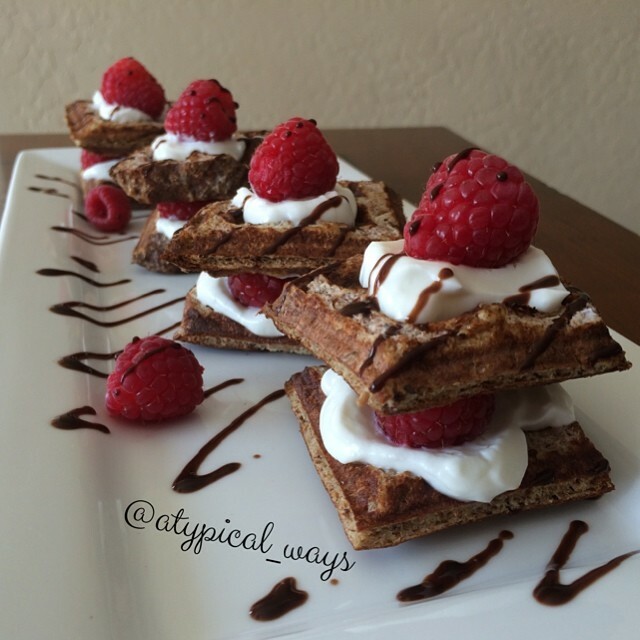 Raspberries & Cream French Toast waffles – only 300 calories! Tired of the same old boring French toast? Well look no further! French toast cooked in a waffle maker instead of a skillet and then cut into mini sandwiches! Mix together the egg, milk, cinnamon, vanilla & stevia in a small bowl until well combined. Place bread in shallow dish where each slice can lay flat. Pour egg mixture into dish and flip bread multiple times until all of the liquid is soaked up. Cook in preheated waffle iron. Once out of the waffle maker, cut each slice of bread into quarters and sandwich with greek yogurt/raspberries. Top with a little sugar free chocolate sauce!